What is in a name? To know a rose by any other, will it still sound so sweet. This installment of the famed love story leaves Romeo and Juliet too much room to improve in order to be deemed a contender amongst the other magnificent recreations that we have been so blessed to see. This version, directed by Carlo Carlei, is an honest attempt, but falls short in any hope of emotionally resonating with an audience. The performances are very bothersome for me. As I anticipated the dramatic love affair between these two young darlings to fully bloom in a state of youthful passion, I was left anticipating. The classic balcony scene was rushed, as were many of the key lines that one identifies with Romeo and Juliet. 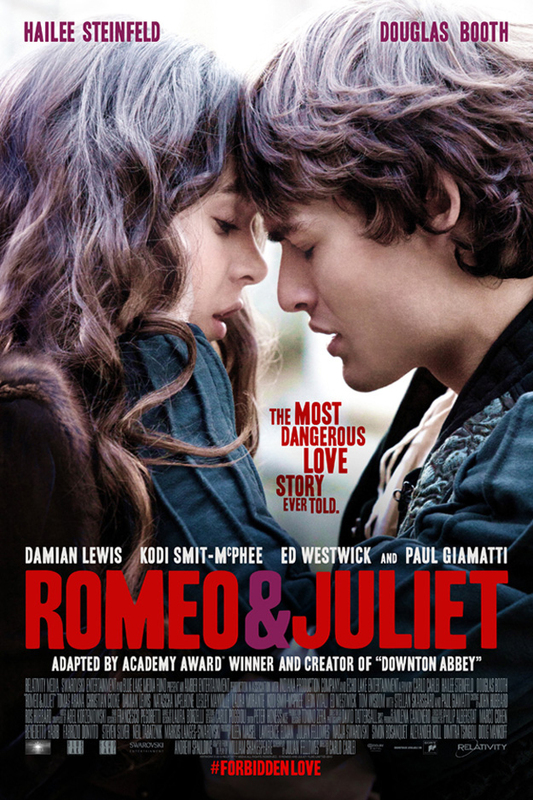 Also, the physical chemistry between Romeo (Douglas Booth) and Juliet (Hailee Steinfield) is stale at best. It’s true I may be spoiled with Baz Luhrman’s Romeo + Juliet (1996) with the incredible raw talent of Leonardo Dicaprio and Claire Danes. These two iconic characters remain challenging roles to fill in any sort of production, and Booth and Steinfield deliver an honest attempt, but it falls flat in the most dramatic of moments. The performance that I found most moving is Friar Laurence played by Paul Giamati. He truly commits to the role, and the result is proven in the interaction he has with Romeo as he is informed of his exile from Verona. Romeo threatens to stab himself with a sheath to end his pain of longing for Juliet, and Friar Laurence justifiably condemns his logic. Giamati doesn’t steal the show, but he makes it a little more entertaining. There are some solid elements to the film, including the set and costume design, both well executed and fitting to the time period. The dialogue is loyal to the original work, and dedicated fans should be able to follow along with ease. The younger group of 10+ is the perfect audience for this film. It serves as a great educational experience for those learning the story, and it’s not too explicit that parents need to worry. There have been better versions, but there have also been worse. If you’re looking for a film to see on a night out and can’t afford Gravity in IMAX 3D, then this is your film. Romeo and Juliet opens today in Philly area theaters.